Sky Jack Morgan: Have you seen THE LOST BOYS? 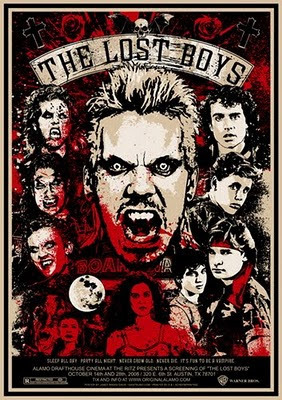 Have you seen THE LOST BOYS? 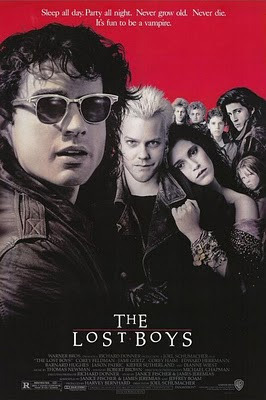 I watched The Lost Boys last night. I got very nostalgic. Can you believe Cory Haim is dead? Can you believe I used to think his hair and Kiefer Southerland's hair was the coolest hair anyone could ever have? This movie is still one of the best movies of its time. It's one of the very few movies with a perfect soundtrack, one of the very few vampire movies worth watching, and one of the very few good Joel Schumacher films. The way the vampires fly is fantastic because you don't see much of it, so it doesn't look cheezey. The gore is choppy and scary without looking fake and lame or overboard or gratuitous. The story is timeless and reads well on many levels. It makes me miss Santa Cruz in particular but California in general. It's strange to have grown up in a place that one sees in films all the time. I think most people don't know what that feels like. Movies take people to places they've never seen most of the time, but I often feel like they're taking me home. This film still has very cozy place in my heart. . . maybe even cozier than it used to. It might also be the movie that gave me my motorcycle fetish. I need a motorcycle. I wasn't impressed, but that was probably because I'd already seen FRIGHT NIGHT and NEAR DARK. I loved both of those, but this was always a childhood favorite. Comics will save your life!